Wydown’s new dedicated bike lane as seen from just east of Big Bend. With its wide shoulders and little traffic, Wydown Blvd has always been a favorite route with area cyclists. Up until recently, the road has been marked with a 7-ft parking lane and a wide 15-ft driving lane that made sharing the road easy for cyclists and drivers, alike. As of just recently, Wydown now has a dedicated bike lane. 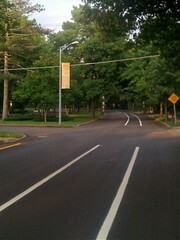 A few weeks ago, Wydown Blvd was resurfaced and crews have just gotten around to laying down the paint. The driving lane has been narrowed and the bike lane inserted in the space created between the driving lane and the parking lane. Cyclists now have another 1.6 miles of pavement to call their own. Yes, the Wydown bike lane has a bit of history. In fact, this is not the first time Wydown has sported a dedicated bike lane. Prior to the spring of 1995, Wydown had a 4-ft bike lane along the curb. The remaining 20-ft of roadway width in each direction, though not marked as such, was frequently used as a two lane road. It’s reported that drivers frequently parked on the street in the bike lane. Make Wydown a two-lane road in both directions. Designate one traffic lane, one parking lane along the curb, and a four to five foot bike lane between them. The approved traffic plan is not one of the three plans Pearl presented in March. It eliminates the designated bicycle path that was part of a popular plan. Fourteen year later, officials have finally gone back and settled on the previously rejected third option. Wydown’s bike lane has returned, better than before. Baird, Kristen (1995-03-20). “Ideas For Wydown Traffic Routing Offered”. St. Louis Post-Dispatch. Baird, Kristen (1995-05-15). “Lanes, Lines: Remedy For Traffic Problems?”. St. Louis Post-Dispatch. The new configuration on Wydown is the correct engineering solution for the street. It is especially predictable as is the goal of all traffic engineering. Conformity and uniformity is what is required on all roadways so that users know where they should be and how they should act.P.S. The "4ft. lane along the curb" to the left of the yellow stripe to which you refer was never intended to be a bike lane but absent striped bike lanes with pavement indications it was unfortunately used as such by both cyclists and runners causing dangerous unpredictable situations. What's there now is not a bike or jogging lane either.